Most mammals tend to be smaller in hot climates and larger in cold ones. This fact is known as Bergmann's rule (or as I like to call it, Chihuahuafication). Now, with climate change on the horizon, just how much will temperature put pressure on animals to evolve to a different size? Here's what history teaches us. 55 million years ago, the Earth went through a major hot period called the Paleocene-Eocene Thermal Maximum (PETM), 175,000 years where the average temperature was up by about 10°F. 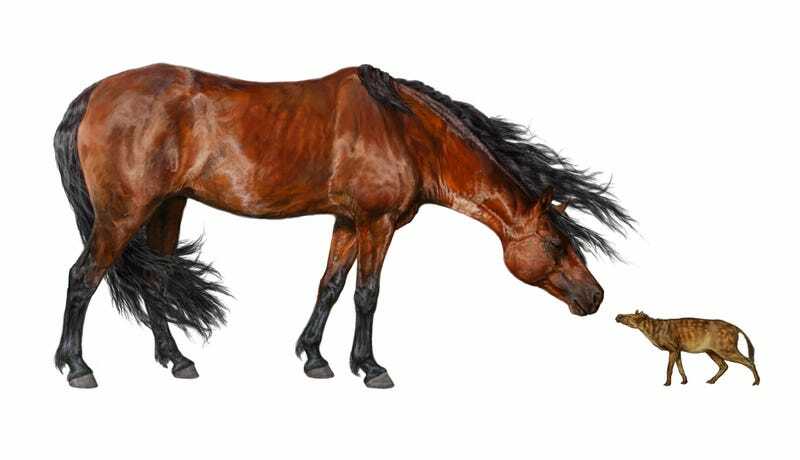 During this period, the tiny ancestors of modern horses went through a dramatic size change, shrinking substantially, and then growing once the weather cooled. Before the PETM, Sifrhippus sandrae weighed around 12-pounds, about the size of a small dog. During this period of increased temperature, their mass shrank by 30% to 8.5-pounds, around what a small cat weighs. Over the 45,000 years after that, they gained that size back, bulking up by 75% to 15-pounds. Some models of future climate change are suggesting we'll soon be undergoing the same temperature change as the PETM, just on a massively accelerated time-frame. There have even been some suggestions that mammal shrinking is already happening. Maybe we will end up with house hippos and miniature giraffes after all.